Product #21154 | SKU 738955 | 0.0 (no ratings yet) Thanks for your rating! 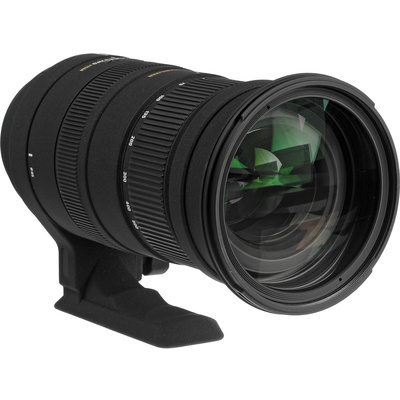 This 50-500mm f/4.5-6.3 APO DG OS HSM Lens for Nikon from Sigma is a zoom lens for digital SLR cameras with a Nikon lens mount. The lens has a standard to ultra telephoto zoom range that is ideal for nature, wildlife, or sports photography. The range translates into an equivalent 75-750mm when used with digital SLR cameras with an APS size chip. The lens is also compatible with full frame cameras. You can even increase you telephoto range by using the Sigma APO teleconverters. The use of the OS (Optical Stabiliser) system, HSM (Hyper Sonic Motor), APO apochromatic design, four elements of SLD (Special Low Dispersion) glass, and multicoated optics all enable this lens to provide a high level of performance throughout its entire zoom range. A rear focus system ensures quick, convenient manual focus and a non-rotating front barrel. Designed for use with full frame digital SLR cameras. May also be used with smaller APS-C size sensors with a corresponding effective increase in focal length to about 75 to 750mm with most cameras.